JOY to the world, the November Luxor Box has come! The holiday season is in full swing and if you’re looking for the best gift to give to the special people in your life, then look no further as Luxor Box is here. Luxor Box is unlike any other subscription box service you have tried before. Luxor Box carefully curates several, classy and luxurious items that make each box so unique and spectacular. It’s clear to see that Luxor Box is a perfect gift to give this holiday season. Who wouldn’t want to open a delightful box filled with four to nine, useful and elegant items ranging from spa products to beauty products, jewelry, apparel and beyond?! There’s no doubt about it, everyone who has joined the Luxor Box family can proudly say that is the best decision they have ever made. Seeing your brand new Luxor Box delivered at your doorstep truly is the greatest feeling. Luxor Box delivers every other month to subscribers and the anticipation leading up to receiving your Luxor Box is all part of the amazing experience. Luxor Box definitely gives you something to look forward to. Halcyon Days Maya Sport or Agama Sport Watch: Halycon Days watches are two words: breathtakingly beautiful. These watches are so sophisticated and you’re going to love wearing yours everywhere you go. Plus, with all of the upcoming holiday functions, the Halcyon Days Maya Sport or Agama Sport Watch will be the perfect finishing touch to your attire. Robyn Rhodes – The “LUXOR” Snake Ring: Robyn Rhodes is known for having some of the most trendy and exquisite jewelry pieces. With snake skin all the rave and one of the biggest fashion trends this winter season, the snake ring is an exceptional accessory for your #OOTD. Cloth & Paper 2019 Spiral Bound Planner: What better way to ring in the New Year than with a fantastic, new planner brought to you by Cloth & Paper in the November Luxor Box! Time to write down your goals for the New Year and one of them should definitely be to continue to spread the word about Luxor Box’s amazingness! Cloth & Paper Message Pad with “Gold Foil:” If you need to write down a special message to remember, you get to do so in style with this fabulous message pad. Cloth & Paper Memorandum Sticky Notes: Need a piece of paper to jot down a quick note? Cloth & Paper has you covered with their super cute memorandum sticky notes found in the November Luxor Box. It’s hard to choose a favorite item from Luxor Box because all of the items are so sensational. Now that you’ve read about the items inside the November Luxor Box, here’s how you can join in on the fun and become a member of the Luxor Box family. Luxor Box offers two subscription plans: either the Luxor Box plan or the Petite Box plan. With the Luxor Box plan, you pay $139 every other month to receive an incredible box filled with four to nine items. The value of each Luxor Box is over $275. Just one item alone from the box equals more than what you’re paying for, so you’re always getting your money’s worth. The Petite Box plan contains two to four items and has a value of over $75. If you want to give someone an individual box for the holidays, then you can purchase a single box for $150 with free shipping. There’s no better way to put a smile on someone’s face than by giving them a terrific gift like Luxor Box. Luxor Box works endlessly to give nothing short of the best to all of their subscribers. From outstanding customer service to marvelous products, it’s clear to see why everyone can’t stop gushing over Luxor Box. Being a Luxor Box subscriber is a lifestyle and truly a splendid and extraordinary lifestyle it is. You definitely don’t want to miss out on the unforgettable experience that Luxor Box gives their subscribers every other month. 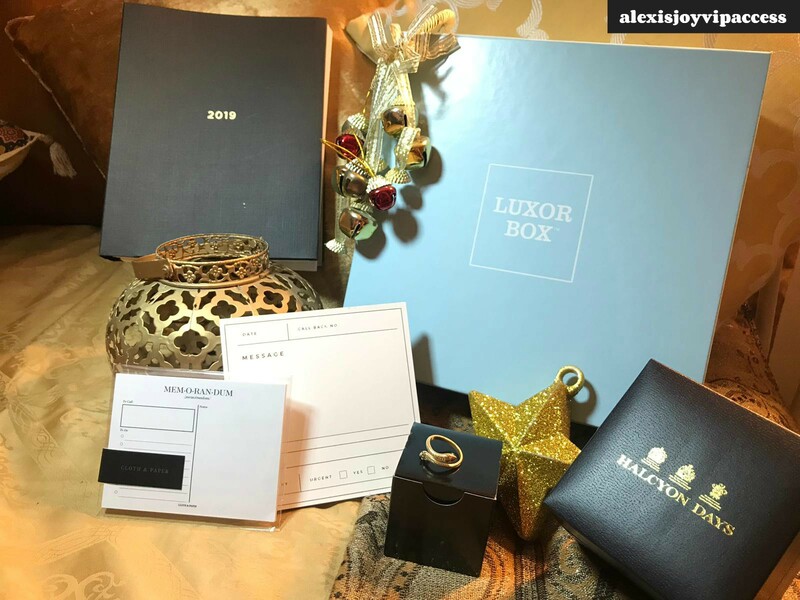 I, Alexisjoyvipaccess had an excellent time teaming up with Luxor Box to share with you all a brand new unboxing video of the November Luxor Box. I show you all of the remarkable goodies inside the latest Luxor Box from terrific jewelry to an awesome, stationary set. See all of the phenomenal items inside the November Luxor Box by watching my unboxing video below! Be sure to follow @LuxorBox on Twitter and Instagram and become a member now by visiting Luxor Box’s website here. Previous VIPAccessEXCLUSIVE: Holiday Gift Guide 2018 For Girls, Guys And Grandparents Featuring Shiseido, Joico And Thoughtfully Gifts! Next Article: Nickelodeon’s Top-Ranked Show “Henry Danger” Surpasses 100th Episode Milestone With Its Ten-Episode Pickup!